Salesboom CRM Reviews Recently Reviewed! Comments: our sales team uses salesboom to manage collaborative sales deals. many people are involved over a long period of time before the customer buys from us. We have to talk to decision makers few times and many tasks have to be done. We love it because the crm automates many of the tasks for our sales people leaving them more time to focus on the closing of the sale. Recommendations to other buyers: I would recommend the fast track because it makes it the responsibility of salesboom to understand your sales process, customize the system accordingly, import your data, and then train your end users. Pros: Cloud based. You can access to the information anywhere. Cons: I wish that the software would be more interactive. Some times, I have to click with the mouse to get what I want when I am used to type and hit enter. Overall: I love it. I use it for my accounting business and for my personal life. I feel that I do not have to try to remember so many thinks. Pros: I could create a CRM useful to me in what felt like minutes. Ability to customize is simple and I could try anything I wanted without `breaking anything. Love it. Cons: Honestly I can't think of anything negative If I had to pick something, I would say it could seduce me because it can do so much. Overall: I am far more organized and effective with managing my clients. It increased my accountability also. Pros: Easy to use, easy to customize. You dont need to be a programmer to make changes. If you can use Sales Force you can use Salesboom and will save your company a lot of money. Cons: You cant reorder columns in reports so they download to the CSV file in the order you want. Hopefully thats something in the works for future upgrades. Overall: Easy pipeline management at a fraction of the cost of other CRMs. Cons: I think this is a great software to use personally I don't have any cons for this software. Pros: I like knowing that my CRM will work perfectly for me no matter the size of my business and I can trust that Salesboom will provide all the necessary support as new integrations and customizations become essential for business efficiencies. I won't have to work with third parties for any of this. That's a comforting tight as both a cost and time saver. The personal touch provided by Salesforce with their fast-tracking program encouraged a painless and motivating onboarding process to become confident in the software's power and capabilities. It's been a huge leap forward from the myriad other software programs used before integrating a CRM into our core business activities. Cons: Its not a good platform by any means, especially when compared to some other well-known platforms. Still new to its implementation but haven't experienced any setbacks. Cons: Easy to use . Salesboom is Excellent sales CRM product for small,medium,large size companies. Super integration with any size database,Great out put, custumer satisfaction Gauranted. Pros: so many different options, so i was not limited on what i could use. i have an events company, and many crms i tried limited my needs because of the space i am in. salesboom had so much going on, that i found exactly what i needed; quote to cash, quickbooks, etc. Cons: i has a dated feel to it, not the functionality rather the look of it. i know that doesn t mean much, but that was my only drawback. that aside, i love this crm. Comments: Salesboom is the only CRM I have purchased that actually works and finally I am seeing a product that we can actually use! I use Salesboom all day every day and personally think that it is the best value for money and one of the best CRM software on the market. I have used different CRMs in the past and most of them have fallen short in the area of missing data, duplicate data and reliability. Salesboom is very easy to customize, I use it to track sales opportunities, reports, forecasts and for support. I highly recommend Salesboom to anyone, if you need anything just ask Salesboom support team. Cons: I was searching for a simple and easy CRM Software package for my team to use and glad I found Salesboom. The only area they need to concentrate on is the daily import limit. Pros: I searched for a CRM that also integrated a quoting system. This is the first I've found and its simplicity and integration with the quoting and CRM is way beyond my expectations. Also, I did not expect to receive the kind of technical support that SalesBoom provides, nor did I expect the understanding that SalesBoom quickly developed for my business needs. Overall: It's the only CRM with a simplified quoting ability that I could find after about two years searching. Also, the customer support is perfect. Comments: After a bad experience with Salesforce.com our VIP of sales was researching cloud crm vendors and he came across Salesboom.com. After the first demo our sales staff was excited about the new CRM as it seemed very easy to use. We decided to go with them especially when we learnt how easy it is to setup the reporting system and the workflow engine. Salesboom helped us export our data from Salesforce.com within 3 days and copied over all our custom fields, objects, views and reports. The best thing about going with Salesboom.com CRM was the after sale training and support. 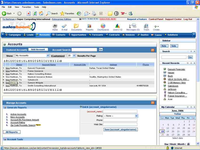 Our Salesboom.com CRM account manager helped us at the begining but we had a dedicated CRM success manager that staid tuned to all our needs and made sure that our crm implementation was headed in the correct direction. Now, after 2 years of using Salesboom.com, our Sales staff love it so much and swear by it. Pros: My Leads are hot and vented to have the most accurate contact information! We source billions in mortgage loan business each week. Cons: Would appreciate some cool looking graphs/charts. The sales funnel is nice and we link the lead to prospect to clients with internal job log systems. Overall: Pre-loaded reliable phone numbers, email and LinkedIn contact details on loans coming due and buyers/sellers of recently completed commercial real estate transactions is a huge win! Pros: It's a highly customized and very user-friendly Cloud CRM. Salesboom.com helped train our users and showed them the rewards of using the system. Therefore, we had no issues with user adoption like other vendors we worked with in the past. Cons: I think that the interface colors need to be changed, but of course, this is the least of our worries. Recommendations to other buyers: My #1 recommendation for Salesboom.com evaluators is to type out all your requirements and send it to your Salesboom.com CRM consultant prior to doing a live demo with them. Also, insist on getting multiple demos to evaluate the system fully. They will look at your requirements and actually customize the system while on trial, which will save you money! Pros: Completeness of solution to both enable the customer analytics to drive the business but also to automate our own customer processes as a small company. Cons: the interfaces and visualizations could be updated. Overall: Lightening fast expertise delivered by both the people and the technology ..
Pros: The CRM was extremely easy to use, and viewing leads was simple and fast within the contact manager. I like being able to see some data about a contact from the main screen of the contact manager. Cons: Salesboom was fine for the very early stages of our business, but we found it didn't offer much in the form of marketing automation, reporting, etc. Comments: We have a complex sales cycle involving contracts and construction projects. Our previous CRM vendor failed to meet our requirements even though we paid lots of money for customizations. 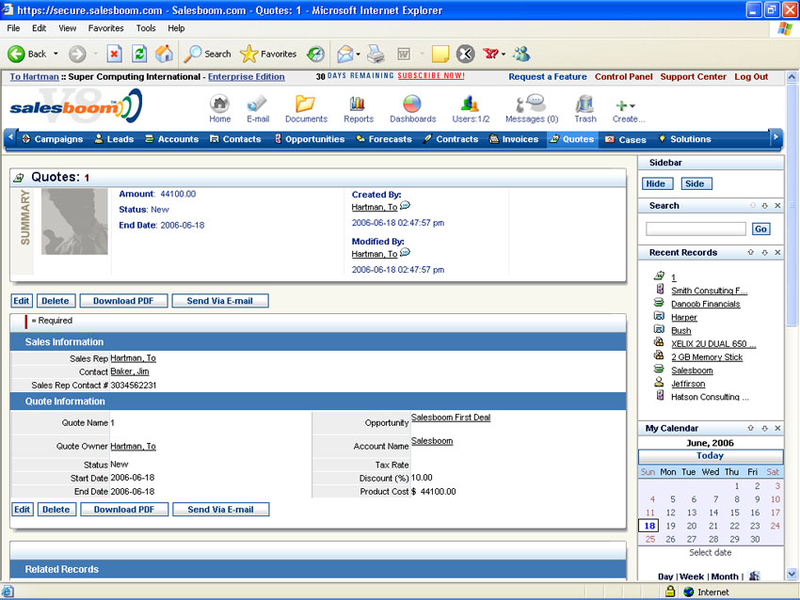 With Salesboom.com CRM their team reviewed our requirnments and needs and offered us a great price for implementation. We demanded a money back guarantee if they fail to deliver on time, and to our surprise it turned out that they do have such a guarantee for custom projects of our size! The team at Salesboom were easy to deal with and very accommodating to our timelines. 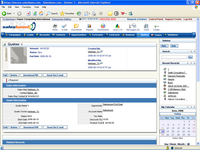 Pros: Salesboom was able to customize the software to exactly what we need. Streamlining the client experience from start to finish according to our business model has made using Salesboom easy. Dealing with a Canadian company makes budgeting easier for our Finance Department and all customizations are all done in-house, not by a third-party provider. Cons: As a Mac user, I find the visuals to be a bit plain, perhaps more geared toward PC users. The font size is also quite small but I have not yet had an opportunity do see if I can change that in my personal settings. Pros: First of it's kind all Canadian CRM. Data Remains in Canada to avoid those peering pesky neighbors. Comments: First, would like to thank you so much for educating us on CRM. It was indeed helpful in helping us to figure out which way to go on this. Again we found our go to meeting with you regarding your product extremely helpful and informative.and without pressure. I am very impressed with your company and it is awesome that it is Canadian. I will highly recommend your CRM to others that are looking for one or wanting to switch. Wishing much success with Salesboom now and in the future. 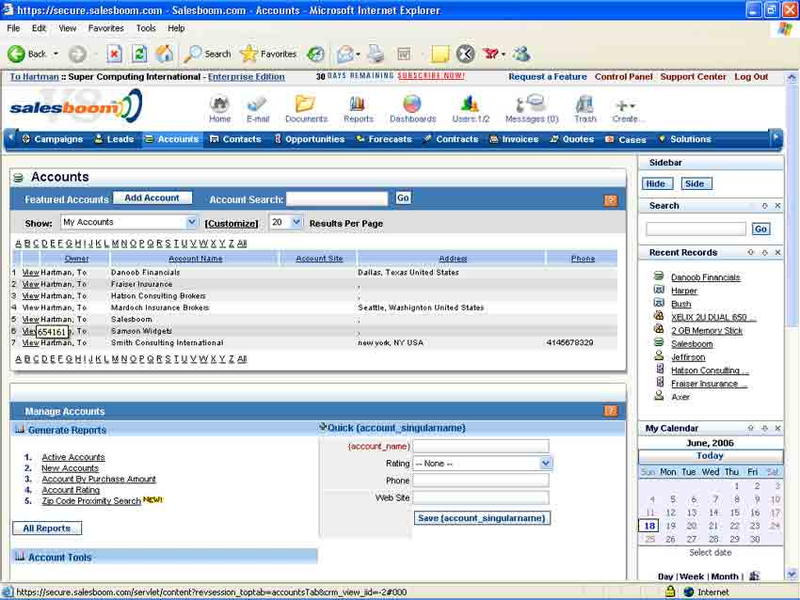 Pros: Salesboom.com is a very user friendly cloud-based CRM system. It's very easy to customize and simple to use. Cons: The only downside to Salesboom.com is that they do not offer a French translation for their system, so you have to translate it yourself. Recommendations to other buyers: I would recommend anyone evaluating Salesboom.com Cloud CRM to speak directly to a CRM consultant and elaborate on your business processes. They are very good listeners, and if they can't help you, they will be the first to tell you. Pros: I have absolutely nothing positive to say about this company and it's CEO Troy Muise. This is a classic case of overpromising and underdelivering. Cons: Much like a previous reviewer stated, my company was never provided with a completed project after many months of waiting. The last communication I had with Troy Muise from the company stated that he would not refund our money, nor complete the project. We spent over $3,000 with this company with nothing to show for it. Troy also stated that he would sue me for libel if I posted any negative reviews of his company. Comments: We use this CRM to manage our sales opportunities. Our employees need to collaborate on each sales deal. All our sales deals take time to close and it is important to use a CRM system to help us manage all the tasks required. Great part of this CRM is when the deal is closed the information is then passed to create invoices in real time, and the information is also passed to the fulfilment department to deliver the products and services as sold. A CRM to Fall in love with! Comments: Right from the beginning when Salesboom.com made it to our CRM shortlist, we were impressed. They were the quickest company to contact us and plan for our trial. They helped us map our business processes and even spent time to cleanse our data and import it into the CRM. All this was before we even decided to go with them. After the sale, they helped us go live in no time. I would recommend the Fast Track if you do not have the time and resources to go live. Pros: It's the most user-friendly Cloud CRM Software system. They offer a Service-Level Agreement and a money-back guarantee. It offers reasonable prices for all editions. It has many powerful features. Cons: I can't find anything I dislike about Salesboom. Recommendations to other buyers: Be accurate and honest while you are looking for any software. I used the Salesboom platform. It is easy to navigate and has straightfoward modules. Cons: Not sure if this exist in other version. As considered developping a global business, I felt that in the long run, there is a necessity to have a sort of protection of our date on the platform, especially if someone, let's say in Australia is using it. Comments: Before paying Salesboom to customize our method of quoting our clients, we sat through numerous consultations and provided them with every piece of information necessary to customize the CRM to provide quotes like we currently do offline. They stated numerous times that this would be no problem. Well it's been 8 months, there has been no progress and they haven't returned our calls or emails from about 2 months now. Pros: None. They are scamming us. Recommendations to other buyers: Dont, use them. Run away. Pros: Easy to navigate, information is accessible and properly organized. Reports are a big plus, very flexible for customization. Wishing much success with Salesboom now and in the future. Overall: Easy to use CRM with deal management and marketing automations! Comments: We love Salesboom.com CRM simply because our end users love it. They believe it is much easier to use than most other CRM vendors out there. Also we love how responsive thier support is. Comments: great product and support is excellent. Pros: Easy to navigate, information is accessible and properly organized. Reports are a big plus, very flexible for customization. Cons: Interface looks can be improved, other than that functionality, learning curve, access to information is excellent. Comments: my life could be a nightmare at work without it! I use it to automate all my sales tasks and activities saving me time to focus on closing the sale.